In terms of fleshed out MMO experiences ArcheAge is near the top of the list with an impressive game world filled with adventures and features around every corner. 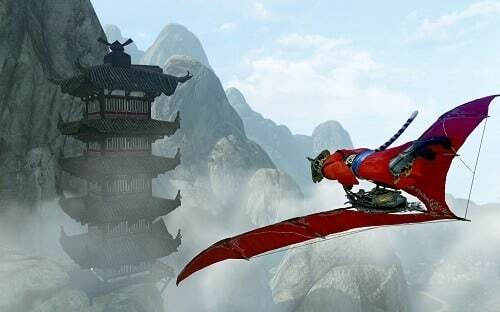 There isn’t much in the way of innovation but ArcheAge brings a huge amount of content and quality to the MMO scene. Set in a fantasy game world the focus of ArcheAge is on being able to change the game world around you while being free to pursue your own path of progression. This is achieved primarily through a rich player housing system and a class free style system that lets you dabble in multiple skill trees as you mix and match your favourite active or passive skills (while ensuring re-specialisation options are abundant). To start your ArcheAge adventure players will choose their desired race from the four options (two for each of the games continents which are hostile against each other). Both male and female options are catered for with further customisation available through the decent facial shaping options to create a unique avatar. The impact of your race choice is fairly minimal with the only real impact being the two unique traits that range from reduced construction time to extra time underwater (nothing game breaking here). 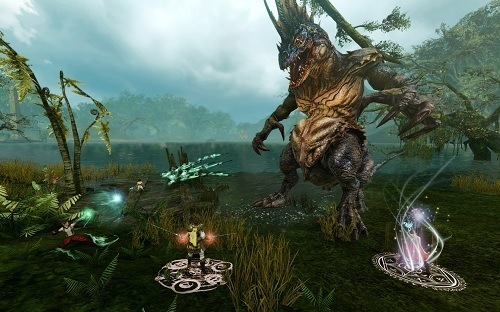 Combat stays fairly true to traditional MMO gameplay with players selecting from skills on their skill bar and being able to macro certain skills together to create combat chains. Where combat changes up the formula though is on the high seas where you can engage in naval combat against powerful sea creatures or other players in PvP. Unlike other MMORPG adventures where anything outside of the main game world and combat feel like tacked on extras ArcheAge does a wonderful job of giving you additional content that isn’t included on a just because basis. For ArcheAge this means deep housing and mount systems that are packed with features and design. On the housing front you have the ability to create small little cottages to massive story mansions and also farm on the land to create resources. While mounts are equally well thought out with an impressive range that will level up and gain skills alongside the player. For vast MMO content and quality across the board ArcheAge ticks the boxes and goes beyond the required. Vast MMO world packed with content and features. Four races at war on two continents. Deep housing and farming lets you carve out a piece of the world for yourself. No skill limitations lets you combine active and passive skills. Good range of quests to keep exploration interesting.